The 6 Best Stratocaster Pickups – Finding the Sweet Strat Sound! What Makes a Stratocaster Pickup? Arguably Leo Fender’s greatest ever creation, the Fender Stratocaster – introduced to the world in 1954 – is one of the most iconic, stylish and versatile mass-produced guitars that’s ever existed. It’s also a guitar synonymous with legends including (but certainly not limited to) Eric Clapton, Jeff Beck, Ritchie Blackmore, Eric Johnson, John Frusciante, The Edge, David Gilmour, and Stevie Ray Vaughan. Oh… and Jimi Hendrix. But none of these guitar masters would have been able to attain the sweet, sparkly, chiming tones they are famous for without a set of great pickups on their axe. On that note, to help you find your ideal Strat sound, we’ve put together this guide and chart on the best Stratocaster pickups to match your budget. Of course, there are many others on the market today, but this short chart will give you a good flavor of what’s hot on Strats at the moment. Note that, while some Strats utilize a H-S-S configuration (humbucker and two single-coils), we focus only on single-coil sets or individual single-coil pickups in our chart. Let’s take a look! One of the best ways to nail Eric Johnson’s sweet tone. A modern Strat pickup with true Hendrix tone. The sound of a Les Paul in your Strat! 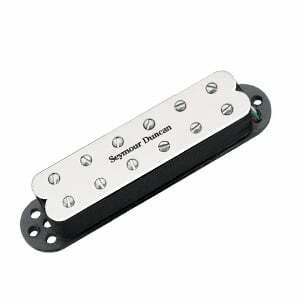 Made by Seymour Duncan, but offer an authentic ‘50s Fender tone. A complete set of Strat single-coils with authentic ‘60s feel. To sound as good as Eric Johnson is a dream for many guitarists – so these Eric Johnson signature Strat pickups are like a dream come true! Designed in collaboration with the master himself, this set comprises three single-coils offering the melodic, sweet tone Eric is famous for. Each of the three pickups have their own unique sound thanks to differing constructions. The neck uses oversized Alnico III magnets, while the middle – based on ’63 Strat pickup – is reverse wound to cancel hum (when used in the 2 or 4 position). The bridge has a much hotter output than you may expect, although retains that desired sparkle. They can’t guarantee to turn you into a virtuoso, but they’ll give you a boost when trying to nail Cliffs of Dover! A bit of a wildcard, although this Lace set impressed us enough to include. This set comprises a set of three very different Strat pickups, which are more humbucker in construction and output, with great power. At the bridge you have the super-hot Red, which delivers a fat tone that’s perfect for heavier rock, chugging rhythms and mix-cutting solos. 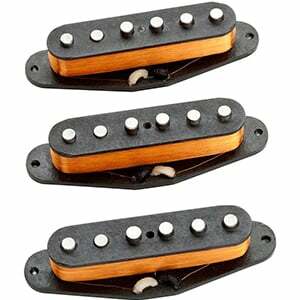 The Silver in the middle is more rounded, with a fat, well-balanced single-coil sound. Finally, the Blue at the neck gives you a smooth vintage humbucker tone – almost PAF-esque. All eliminate hum very adeptly. 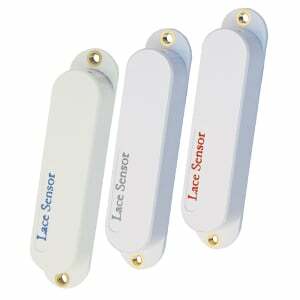 They come with white vinyl covers featuring the appropriately colored Lace Sensor logo (black and cream versions are also available at a higher price). They won’t impress every Strat player, but some will love them! When Jimi Hendrix appeared at the 1967 Monterey Pop Festival, the world stopped and listened (and then watched as he set his poor Strat alight!). To celebrate this event, and to help you recreate that much-desired Hendrix tone, DiMarzio have produced the DP419 Area 67. This single-coil pops into your Strat to deliver accurate sounds from the Summer of Love. Great for the neck and middle positions, this pickup uses an Alnico II magnet to deliver a smooth sound which is natural, bright and trebly, with no loss of sustain associated with the Alnico Vs of the originals. Another modern upgrade is that they are designed to be quieter than the originals when it comes to background interference and hum. For the price, this is an awesome pickup. If your Strat is cut for three single-coils but you crave a heftier vintage tone, then this Little 59 from Seymour Duncan may be exactly what you need. Also available in a neck model, this bridge pickup is a single-coil sized humbucker, with the charm of an original Gibson ‘59 PAF. The wax-potted humbucker features a ceramic magnet with adjustable pole pieces, allowing plenty of fine-tuning for the perfect sound. It has a medium output and a warm tone, with twangy cleans. It also takes gain beautifully – it’s therefore very versatile, and more than suitable for country, blues, jazz, funk and classic rock, while it copes well with heavy rock too. For guitarists that want the best of both worlds, it’s a good value option! 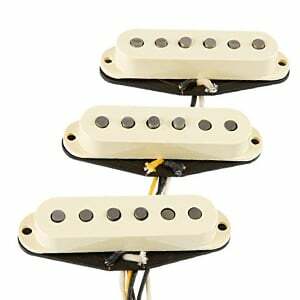 This set of three single-coils from Seymour Duncan is made to similar specs as the Strat pickups of the ‘50s, and – as such – offers a true vintage tone that impresses. Each pickup uses an Alnico V rod magnet, specially wound with heavy Formvar magnet wire, leading to an incredibly glassy, sparkly tone with great chime. Wax potted for squeal-free playing, they’re pretty versatile, but we found them especially good for funk, blues and classic rock (although you’re looking in the wrong place if you play anything heavier). Although the focus is on the trebly chime-like qualities, the low-end isn’t lacking on these SSL-1s, and prove quite well-rounded. Chords ring out beautifully, with great note definition, while lead tones are very bright, cutting through any band mix. When it comes to adding an authentic ‘60s vibe to your Strat, it’s hard to beat a set of Fender’s Tex-Mex Strat Pickups for convenience, sound and value. They certainly deliver accurate Strat qualities – a bright and balanced tone, with a surprisingly high output. Hard to fault either clean or with gain in all five positions, and are capable of coping with heavier stuff. 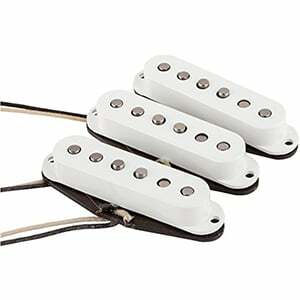 Included are all three single-coil pickups (bridge, middle, and neck), with simple aged-white vinyl covers that look the part on any Strat. The pickups feature Alnico V magnets wrapped with Formvar wire, with an overwound bridge pickup for a slightly hotter output – this one really screams. Easy to install, this set can turn a cheap axe into a tone monster! A Stratocaster pickup is a standard single-coil pickup – typically consisting of a set of magnetic poles/slugs, wrapped in a hair-thin wire. These are sandwiched between two ‘flats’ (a baseplate and a top plate), then protected with a cover made from vinyl, chrome or brass. They differ slightly from Telecaster pickups in that Strat single-coils are shorter than Teles, they aren’t mounted onto a metal plate, and traditionally have a slightly higher output. Aside from the iconic shape of the guitar, a Stratocaster is easy to recognize thanks to its familiar pickup setup. Traditionally, Strats have three single-coils placed at the bridge, middle, and neck positions. These are usually controlled by a five-way pickup selector switch that allows you to choose between the three, playing two together in the 2 and 4 positions. However, some Strats will break the mold and have a humbucker in the bridge position in addition to the neck and middle single-coils, in what’s known as a H-S-S configuration. You can also find a H-S-H configuration, with a second humbucker in the neck, but this is much less common – and certainly not one for the Strat purists. As for tone, Strat pickups give the classic single-coil sound that lead guitarists crave – bright, glassy, crisp, clear and bell-like in qualities. They can cut through any mix for epic solos, though are excellent for rhythm playing too. As such, they are very versatile for a broad spectrum of genres, and are found across the world of music – country, surf, pop, heavy and classic rock, soul, punk and blues. While they have been successfully used for heavy metal to good effect, the more intense modern metal styles are usually better suited to high-output humbuckers. Just like any single-coil – including a Telecaster or P-90 pickup – the Strat pickup’s biggest downfall is that they are prone to hum, especially as you start to crank up the volume and distortion. 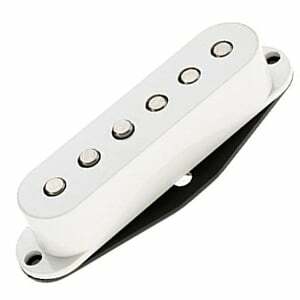 They also have a lower overall output when compared to humbuckers and P-90s. Whatever your style, adding a new single-coil to your Strat can really bring the tone to life – whether you play an entry-level Yamaha or a premium made-in-America Fender, there’s no tonal craving a new Strat pickup can’t solve! Read our chart for some inspiration, but make sure you check out some reviews and watch a couple of videos of each pickup in action, to give you a solid idea of what they sound like. Then you can buy your ideal set, fit them to your axe, and play the night away. Good luck! Lindy Fralin pickups should be included. I’m a big fan of the custom shop 69 pickups! The bridge pick up is the perfect pickup for surf style music IMO. Seriously, how did you overlook Lindy Frailin pickups? Interesting but I’m looking to replace the factory humbucker on my HSS strat with a high output humbucker. Any suggestions will be appreciated. If you’re very much on a budget, you really can’t go wrong with any Fender brand pickups. The Tex Mex, hot noiseless, 57/62’s, all can be purchased under 130$ or so…some under 100 bucks. Right there your guitar has HUGE upgrade. If you have a certain tone on mind, look to the more boutique types from Fralin, Lollar, etc. Yes you’ll be around 300 bucks, HONESTLY, unless you’re a tone FREAK, and been playing a long while, you really may not see a 150$ difference. For 300 bucks, you can get set up VERY WELL!!!! $100 for some EXCELLENT Fender Pickups, then take the other 200$ buy a used small 5 watt +/- tube amp, like a used Bugera V5, used Fender Pro Jr, used vox ac4. Now you have new Fender Pickups, and a beautifully sounding all tube amp. That tone will be night and day from what you had prior!! Fender Tex Mex Strat pickups are the best value of the bunch. <$70 on eBay at times. They SCREAM and are every bit as good as Fender Texas Specials which cost around $170…I seriously can't tell the difference. Have many of the above in a junk drawer…. Don mare, and Virgil arlo pickups are in my strats, white o tones and 1954s my tone quest is over, and am happy with my strat tone. Well worth the money and waiting times. 57/62 are some of the best fender pickups but I hate tex-mex. I have had them in two guitars and find them to gritty and hot.The pickups in my 60’s reissue sound better then tex-mex. another great fender pickup is the 59’s. that is a great pickup.Ive had the Lace sensors in strats when fender put them in back in the 90’s they were great pickups. Does anyone have suggestions for ‘do most everything’ strat pickups? I have a newer Strat Elite(2017). Not crazy about the stock pickups. My band plays a bit of everything — rock, pop, Motown, country. No heavy metal. So I need an awesome warm clean … but something that can get dirty too (Zep, Aerosmith, Santana, etc.). I’m at a point where I don’t want to take my 73 Les Paul to gigs anymore. ALL suggestions welcomed and very much appreciated. I was trying to find the very STATOCASTER tone on my neck pick up. Cristal clear tone. But very far from classic strat tone. Tone is amazing but VERY LOW output. Is alnico 3. So you better set them close to the strings. And recommend to solder a Duncan set of capacitor in serie on the volume pot, that allows you to roll down the volume without sacrificing tone integrity. BTW… Duncan is referred as a type of connection, not the Brand. I think there are some squier that sound Just Right, and they carry ceramic pickups. Honestly I can afford an expensive instrument, but I’m not fool. Cheap trick’s guitar player has a borrowed tele that is no willing to return it to his owner. The Final Countdown and the whole album (EUROPE) was recorded with a Japanese fender… just to name a few. So my question is, what are we looking for or how much are we willing to spend to improve a 5% tone ? If there is really 5%. After all I think is in your fingertips.